My late uncle's regimental number was 712747. According to the records in my files obtained from the Personnel Records, National Archives of Canada, Arthur Gallant enlisted on January 12, 1916 at Summerside, Prince Edward Island. The choice of words is interesting here on the enlistment papers. To describe the age of the enlistee, the question is "Apparent age", as opposed to just "Age". Arthur put his age as 18. His physical description is 5 foot 4 1/2 inches in height, 34 inch fully expanded girth. He had a dark complexion, gray eyes, and brown hair. He was deemed "fit" for duty for the Canadian Over-Seas Expeditionary Forces by J. A. MacPhee, M. D., Medical Officer. He returned to Summerside on March 2, 1916 and filled out an Attestation Paper. He signed the date of his birth as August 27, 1897. He took two oaths and signed his name to both of them. On March 10, 1916 he signed on with the 105th Overseas Battalion. On July 15, he boarded the S.S. Empress of Britain at Halifax and arrives at Liverpool, England on July 25, 1916. As his record shows, he was moved to a number of different Battalions (104th, 26th, 78th). He spent some time in a military isolation hospital in August of 1917 and was discharged from the hospital on October 9, 1917. 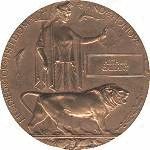 As a member of the 78th Battalion he died of wounds received in the field of battle on September 28, 1918, just one month after his 21st birthday. In late fall of 1988, I made a request to the National Archives of Canada to reissue my late uncle's war medals on behalf of my father. The original medals had been lost years ago. The medals, along with a certificate of military service was dispatched to me just before Christmas of 1988. With copies of his brother's attestation and enlistment papers, and along with his service medals, these personal items which had been lost by time made for my father the best Christmas gift. My father admits to having very little memory of his older brother Arthur, as he would have been about 4 or 5 years old when Arthur went overseas What he does remember very clearly is when Father F.X. Gallant arrived at their house in Howlan from St. Anthony's Church in Bloomfield. The church was at the top of a hill and only a few kilometers down the road. It sadly became Father Gallant's duty to inform my father's family of the tragic news of his brother's demise. This surely must have been a sad time. I think about the grief stricken parents and siblings who on this day learned of young Arthur's death and how so heavy their hearts must surely have been. As a parent myself, I cannot imagine a greater burden to bear. I think of my late uncle Arthur from time to time, especially on "Remembrance Day", November 11 here in Canada. I ponder about his thoughts when as a young and naive soldier boy he boarded the Empress of Britain in July of 1916, completely unaware of the fate which awaited him and many others like him. All of those who served from their small community were no doubt considered heroes. Was he excited and proud to be off on this mission to help liberate Europe? Was he feeling sad about leaving his family behind, and was he certain that he would return? Almost certainly, as a young boy, he would rarely have thought about meeting his end on some bloody battlefield or bombed out village For young Arthur this was more likely an opportunity of adventure than anything else. But like most he would very quickly discover the bitter truth during his military campaigns. Young Arthur would be required to grow up very quickly. It is unclear to me at this point which locale or battlefield it was, or circumstances which inflicted his fatal wounds, or what the nature of those wounds were. Hopefully, with the assistance of the government departments responsible for these things, I hope in the future to discover that. From the documents that I have in my possession, it is unclear as to whether or not he died immediately in the "field of battle", or later at a military hospital. I do not know for example, that when he had been fatally wounded, was he conscious or not? Was he able to dwell on his situation and think about his family back home? Would it have been clear in his mind that death lingered so near? Would he think about his friends, returning to school, working on the farm? Would he think about getting married and having a family of his own? I dwell upon the memory of a brave young man who left home a hero and whose memory only lingers as a hero. Though I am sure he was given a proper Christian burial with fitting military honor and respect, probably with some members of his battalion present, he had no one from his family to mourn for him as he was laid to rest. Only later would the grief of his family back home and so far away on Prince Edward Island, would be the only tangible legacy that the tragedy of war would leave behind. Sadly, this is always the legacy of war. May 16, 1997. Writer: Joseph Paul Gary Gallant. "Whilst with his Company advancing through Bourlon Village on September 27th 1918, he was severely wounded in the head by pieces from an enemy shell. His wounds were attended to, he was removed to a field ambulance and later evacuated to No. 30 Casualty Clearing Station where he succumbed the following day." 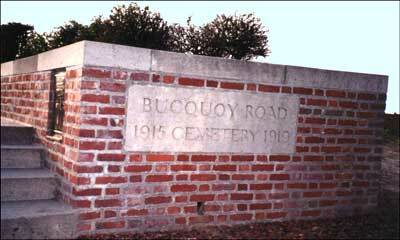 On this same document, under the category of "CEMETERY" it says the following... Bucquoy Road British Cemetery. On this same document, under the category of "LOCATION OF CEMETERY" it says the following... Ficheux, 4 1/2 miles South of Arras, France. "In the end of my death I give the whole of my property to my mother Mrs. Susan Martin, Howlan Road, Lot 5, P.E.I., Canada." Interestingly, he mentioned his mother by her maiden name of "Martin". He then signed the document, with his rank and unit number (Pte. 105 Batt), and dated the document as August 14, 1916. And with this, thanks to the National Archives, I can end my search about my young uncle. It is my hope that one day I will be able to personally visit his grave site and rightly pay him honor and respect for my liberty. May 30, 1997. Writer: Joseph Paul Gary Gallant. Today I received a reply regarding my inquiry concerning the exact location of my uncle Arthur's grave in France. The letter comes from Claire Leger (for Secretary-General) of "The Commonwealth War Graves Commission". She sent along a small map of France with the location of the cemetery highlighted. There is also a cemetery plan showing the exact location of the grave. 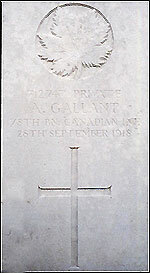 As mentioned above, he is buried in the Bucquoy Road Cemetery, Pas De Calais, France in Plot 4, Row B, Grave 31. Interestingly, it also mentions that the 78th Battalion, which he had been serving in at the time of his death, was a Manitoba Regiment of the Canadian Infantry. These papers are also in my records. God bless you uncle Arthur, and we are eternally grateful for your sacrifice as well as the sacrifice of all allied soldiers who perished with you. May 19, 2002. Writer: Joseph Paul Gary Gallant. During the early part of this month (May 2002) it so happened that a friend of mine from my work went to France with a two other associates. All three of these people are intensely interested in the history of World War 1 and World War 2 while they dedicate a good deal of their time and effort to preserve that great heritage in a number of ways in their own lives. They do this, not just for their own enjoyment, but also to educate others on the great historical significance of our country's sacrifice and contributions to the war effort. When they were planning this trip, they picked the destinations that bore either significant historical meaning (such as Dieppe) or were significant in other ways; such as military cemeteries, particularly those where the remains of their relatives or the relatives of their friends rested. Before leaving on their trip, this particular friend of mine whose name is Mike Dawson, volunteered to find my uncle Arthur's grave and photograph it for me, as no one from my family has ever been there to pay their respect. I was very thrilled at this prospect. I supplied him with the information which had been given to me by the Commonwealth War Graves Commission, including a map which shows the location of the cemetery and the grave. I also gave him a copy of Arthur's photograph. Upon his return he presented me with the photographs he took of the grave, the cemetery entrance and memorial. Lastly, and very significantly, he brought back with him a handful of clay from the top of uncle Arthur's grave. Mike did this for me, and said that he wanted this to be "more personal" than simply the photographs. I was incredibly overwhelmed by this kind gesture. I only wish my dear father were alive to be able to appreciate this with me. 4 1/2 miles South of Arras, France. Being able to see the photographs of uncle Arthur's grave was a very moving experience for me, but the clay from his resting place was even more significant. This must seem strange to some, since I obviously never met my uncle Arthur, although I certainly feel as though I know him well. It has taken eighty-three years for any significant physical connection between Arthur's resting place and his family to occur. Although my family and myself have the knowledge and memory of Arthur's short life, we now have something tangible to remember him by. Another of Mike's travelling partners, and also an associate of mine from work, Doug Marriot, also gave me a set of photographs that he has taken while at the Bucquoy Road Cemetery. Words cannot adequately describe my gratitude. 3. St. Anthony's RC Church Registry.Bloomfield, P.E.I. 4. Acadian Museum of P.E.I.Miscouche, P.E.I. Return to "Lest We Forget" Page!